As an athlete prepares throughout the year for one or more events, the progressive training loads and subsequent recovery allows for an increase in overall fitness (which is considered to be faster speed, strength, and endurance or multiple combinations of these). As you close in on a goal event, maintaining a typical weekly overload and recovery schedule isn’t ideal to achieve an athlete’s potential on race day. You need to sharpen the body’s ability to perform. This is the function of the taper. The taper is the controlled decrease in training load required to bring an athlete to that pinnacle of a focussed mind, and a body that has shed all fatigue and is fresh to go. This is race readiness; if it were just a matter of reducing the workouts volumes and/or intensities it would all be so simple! Getting to that point is as much an art as well as science. There has been considerable research as to how the body reacts to the variations in reducing training load in preparation for an event. The taper can been defined as “a progressive, nonlinear reduction of the training load during a variable period of time that is intended to reduce physiological and psychological stress of daily training and optimize sport performance1”. The fly in the ointment is that individuals react differently to this reduction in training. Every athlete is unique as to how fast they recover from preparation, what they require to sharpen, and their reaction to travelling long distances to arrive in a different climate. Determining what each athlete requires takes time and some experimentation. This is where a coach is invaluable in getting the process right for an athlete ready to race. Reducing the training load (frequency and volume) by 20 percent per week in the two weeks leading up to competition is a good place to start. One has to be aware that while frequency and volume should be reduced, keeping some intensity is required and has been shown to be very effective. That is because as the body recovers from the “load” but still needs to remain sharp neuromuscularly for the task at hand. There are a number of ways to approach the weeks that lead up to a race. Factors to consider are the ability of the athlete to recover, the overall training load and the type and duration of the event. An athlete training 8 to 10 hours per week most likely doesn’t require much of an adjustment as overall volume is quite low. 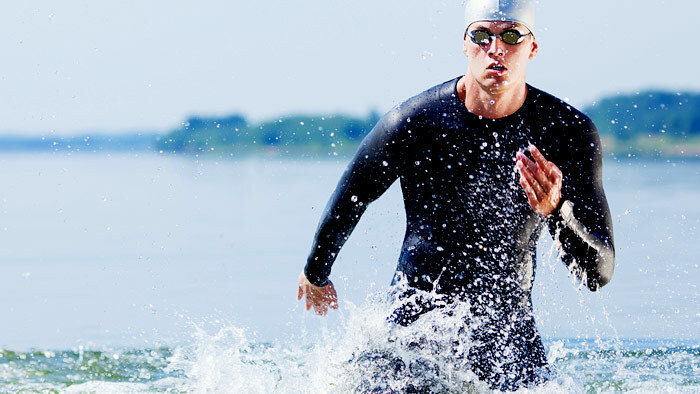 A well trained athlete putting in 18 to 20 hours per week leading to an Olympic Distance triathlon requires a more careful approach. Linear: A basic “Linear” taper is straightforward and involves reducing the workload 20 percent two weeks out and a further 20 percent in the final week in the lead up to the race. Exponential: The third and final taper is “Exponential”, where the initial volume is gradually reduced 2 to 3 weeks and gets progressively less in the final week prior to the event. For many, this taper is ideal for recovering from the final block of training and then sharpening the body and mind in time for race weekend. During the taper, endurance volume is the primary reduction in training load. For Olympic and Ironman 70.3 distance events, maintaining specific intervals that reinforce race pace as well as short (less than an hour per) lactate threshold interval sets are effective. For Ironman preparation, arriving to the start line really fresh is key as the pace is not fast on race day, but muscle fatigue is amplified after several hours of competing. I have found that some athletes rest really well into events and race fast when fresh. These tend to be athletes who have more natural speed, and rely on well rested muscles to go fast. In this case, I like to rest these athletes for the 7 to 9 days into a key event, with low volume while touching lightly on pace work. Others tighten up and are sluggish if they do not remain activate enough. These are the “diesel engine” athletes who rely on high cardiovascular fitness and can perform aerobically at a higher percentage of their lactic threshold. In this case, I will rest this athlete in 7 to 14 days prior to the event and then gradually build them up on race week, sharpening in the 3 to 5 days prior to the race. Another consideration is that running, which is weight bearing, results in greater muscle impact than swimming and cycling, so athletes should be careful with run volume on race week. If an athlete is very inefficient of one of swimming, cycling or running, the resulting fatigue from that activity may be higher as well, so volume in that specific activity should be watched. One of the keys to determining what works best for an individual for race sharpening is to keep a regular meticulous log of training leading up to your goal event. Record morning weight, hours of sleep, sleep quality, and general overall feeling in the Metrics chart of your Dashboard. Log meals to perfect that ideal pre race meal. Identify patterns that led to the days that you felt great, so you can replicate this protocol through your taper. This is also an excellent resource after an event to see what contributed to race day success.